With its 3,785-litre product tank, the all-new Case IH Patriot 3330 sprayer has been built with all the premium features incorporated in the Patriot 4420, making it ideal for small-to-medium sized operations. A leader in the early innovation of self-propelled sprayers, the Case IH Patriot range is well respected by growers and spraying contractors for their high productivity, uptime and application quality. "Like its big brother, the Patriot 3330 takes this innovation several steps further. With significant increase in operator comfort, productivity and power, it is the ideal replacement for tractor-sprayer combinations to reduce cost per hectare,” said Ross Johansson, Brand Manager Patriot Sprayers. Featuring a 6.7-litre electronically controlled engine, the Patriot 3330 sprayers are powered by a 250 HP engine rated at 2,200 rpm. Peak torque is rated 1070 Newton metres at 1,400 rpm to provide plenty of power to pull through soft ground and hilly conditions. 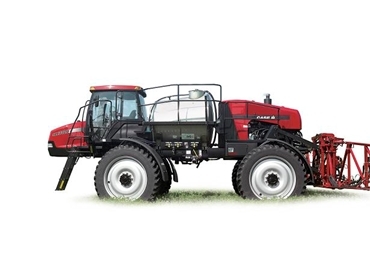 Like the 4420 model, the new 3330 farm sprayers rely on Case IH's proven cab forward - rear engine configuration with the product tank in the middle to provide optimum weight distribution and reduced field rutting. The rear-mounted engine also ensures the cab is very quiet with a decibel rating of 71 dBA. Equipped with a new EZ-Fold boom control feature (auto-fold for 120-feet booms), operators can fold or unfold both the left- and right-hand inner and outer booms simultaneously with the touch of a single switch. The rugged and durable 27m boom is equipped with a hydraulically suspended parallel link style lift. The outer boom sections can be folded up to provide an 18m spray width for increased manoeuvrability around obstacles such as trees and power poles. The AIM Command spray technology system, which operators have become accustomed to on earlier models is also available in this sprayer. This technology uses pulse width modulation to uniquely manage pressure and droplet size independent of speed and rate. Operator comfort and visibility is ensured with the standard Surveyor cab offering plenty of leg and elbow room. Features of the Surveyor cab include an Optima air ride seat, which swivels 20 degrees to the right and offers numerous adjustments for a perfect fit. Additionally, all the routine controls are mounted on a right-hand console that is attached directly to the seat.